How many kids play soccer? 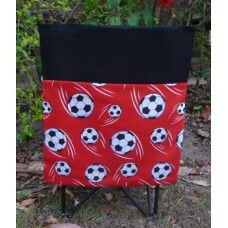 This chair bag is great for both girls and boys who love the game of football. Made in Australia from 100% durable cotton this black chair bag with soccer balls on a red background will have them talking in the classroom. Designed to fit straight backed chairs. they are available in 3 sizes. Machine washable in cold water. Also available in blue. Design: Red Soccer Balls on Black. Placement of pattern may vary. A great storage solution for both school and home from Pink Petunias. Featuring racing cars on a bot..